A clear definition and meaning of terms used by various religions is achievable based on their etymological root analyses. When the semantics are unambiguous, spirituality from diverse traditions can be unified. Since ancient times, humans try to figure out humanity’s place in, and relationship to, the heavens. The Western world views rely on creator God as the answer. The Eastern world views philosophize on Natural Laws. Religions emerged when the philosophy on natural laws were revered as divine and thus became anthropomorphic deities. (1) In the above table, the placement of “Righteousness” and “Awe” under their respective column is merely grammatical. They should be reversed so that the theological meaning makes sense literally; i.e. Awe of the universe descends into righteousness in humans. (2) Dao means the way, natural law that governs the actions of the universe. In humans it descends into moral virtue that governs human behaviour. (3) A Hindi word, Pran Means "breath" in Sanskrit; Prana/Prajna is a life-giving force. (4) Dharm is now replaced by Dharma means "cosmic law and order", Dharma is teachings of the Buddha. In Hinduism it means 'duty', 'virtue', 'morality', even 'religion' and it refers to the power which upholds the universe and society. Hindus generally believe that dharma was revealed in the Vedas although a more common word there for 'universal law' or 'righteousness' is rita. Originally, Dharm means framework or uphold. (5) The Hindi word KARM means action/deed. Karma (Sanskrit: कर्म; Pali: kamma) means action, work or deed; it also refers to the spiritual principle of cause and effect where intent and actions of an individual (cause) influence the future of that individual (effect). It means fate. In brief, action (Karm) produce residues (reaction) call karma, immediately or over time. (6) Placement of the two terms Tathāgatagarbha 如來藏 and Alaya 阿賴耶識 in the above table conforms to current mainstream Buddhist teaching, which is in error probably as a result of corruption of the teaching after thousand years of broken lineage transmission. 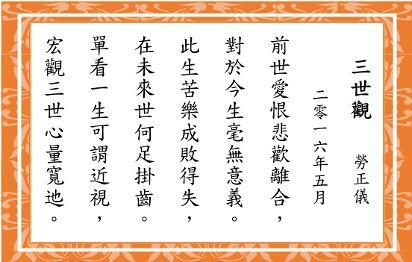 The correct placement should be Alaya 阿賴耶識 under the Universe column and Tathāgatagarbha 如來藏 under the Human column. The Etymological explanations for rectifying this mistake are as follows. Tathāgatagarbha is exclusively a Mahāyāna concept (Buddha-Matrix, Buddha-Embryo, Buddha-Essence, literally “the womb of the thus-come-one”) within all sentient creatures; “the womb” or "embryo" (garbha) of the "thus-gone" (tathagata), or “containing a tathagata”. In short, it means the unborn Buddha, the potential for enlightenment, in everyone. (Ālaya) A Sanskrit word meaning “place” or “abode,” but used in Northern Buddhism to refer to the Universal Soul; A Buddhist term that means the Universal Soul, the anima mundi, or soul of the world. It is derived from the Sanskrit “a”, not, and “laya”, dissolve, hence the “indissoluble.” In its essence, Alaya is changeless, thus equivalent to MULAPRAKRITI, but in its lower aspects it is subject to change. During its manifestation, the consciousness of Dhyani-Buddhas or even high Yogis can merge with it. Thus in the Yogacara tradition, the spiritual self of high yogis or progressed adept is also called Alaya. 1. All matters are energy (i.e. all physical are metaphysical). 2. All energy is information (i.e. thermodynamics). 3. Information is encoding in the language of geometry (e.g. black hole entropy). 4. All information carries meaning (i.e. low entropy, order). 5. All meanings are only meaningful to a conscious being or observer (e.g. Availability of which-way information in a double slit experiment). Therefore, consciousness and information must coexists hand-in-hand. The universe evolves and life on earth evolves. This is observable phenomenology. Premise #6 can be rewritten as “information and consciousness co-evolve”. This is ontology. Space-time is an emerging phenomenon from the most fundamental stuff information-consciousness, which is the ultimate reality. When space-time is out of the question, the concept of forward causation, which is space-time dependent, is also out of the question. Causation can be retroactive (e.g. delayed choice quantum eraser double slit experiment). Future events influence past records. Viewing this co-evolution as a feedback loop, information-consciousness self-creates and self-perpetuates. There is no beginning or creator because there is no restriction on causation. Conclusion: In layman's term, all unconscious and conscious beings cause collective consciousness (God) to exist and evolve and vice versa in a feedback loop; collective consciousness (God) causes all conscious and unconscious beings to exist and evolves and vice versa in a feedback loop. 佛家宗派： 法相唯识宗 Buddhist Yogacara consciousness-only. 印度教僧佉 (數論 ) 派 / 瑜伽派 Hindu Sankhya / Yoga Philosophy.